A new yellow-eyed grass, Xyris bracteicaulis (Xyridaceae) has been described by Dr. Lisa Campbell of the New York Botanical Garden. It is known only from a single historical collection from Lake Ronkonkoma on Long Island which also makes it a new endemic plant for the state. The Coastal Plain pondshore habitat in New York supports dynamic plant communities with species rare for the state. In this publication from Harvard Papers in Botany, the new species is described, illustrated, and compared to morphologically similar specimens. To access the article CLICK HERE. In 2008 Heather Liljengren and Camille Joseph, staff members of the Greenbelt Native Plant Center in Staten Island, were collecting graminoids for seed preservation in Inwood Hill Park on the northern tip of Manhattan Island during the last week of May. They noticed a sedge that looked different and collected it to send off to Dr. Rob Naczi, a sedge expert at the New York Botanical Garden, for identification. Dr. Naczi confirmed it as glomerate sedge. Then in June 2009 Rob Naczi himself discovered it in the southwestern portion of the botanical garden grounds near the Bronx River during a survey of the plants of the Bronx Forest. Both of these discoveries were then reported to the Natural Heritage Program in 2011. Only three populations of glomerate sedge have ever been reported from New York (there is also a Torrey specimen at NYBG with no location) which is at the northeastern edge of its range. It was first collected from the Perch Lake area of Jefferson County in 1949 then again in 1959 from the Spring Valley area of Rockland County. In 1988 Mike Oldham, a Heritage botanist from Ontario, collected it in Oakwood Cemetery during a trip to the Natural Areas conference in Syracuse. Another trip to the cemetery site in 1990 did not find the plants again. All of these collections occurred during the last week of May or in June. For 20 years there were no more collections or sightings of this sedge in New York until that day in Inwood Park. This sedge now has the distinction of being the only state endangered or threatened plant that currently exists on Manhattan Island. From the New York Natural Heritage Program conservation guides we have the following information about identifying this sedge: There are three other members of Carex section Phaestoglochin (C. sparganioides, C. cephaloidea, and C. gravida) that are similar. Carex sparganioides is perhaps the most different from C. aggregata of these three. It has a more elongated inflorescences (3-15 cm long) with a larger proximal internode. In addition the widest leaf blades are 5-10 mm wide (Ball 2002). Carex cephaloidea is the most similar to C. aggregata of the species that occur in New York. Carex cephaloidea has the widest leaf blades (4-)5-8 mm wide and the ligules are just longer than wide. In addition, the pistillate scales are 1.5-2 mm long, subobtuse to acute, and the bodies are no more than 0.5 times the length of the perigynia. Mackenzie in his description of C. aggregata (as C. agglomerata) used culm scabrousity to separate C. cephaloidea and C. aggregata. The angles of the culms of Carex cephaloidea being strongly serrulate while those of C. aggregata are only roughened just below the inflorescence. These character states may be incorrect or subtle. Carex gravida does not occur in NY but was attributed to the state incorrectly in the past. It is not expected in the state. Carex gravida mainly differs in having the summit of the leaf sheath fronts white, hyaline, not thickened, and fragile. Carex aggregata illustration from Britton and Brown 1913. NYFA Board member Steven Daniel reported that he recently found a population of puttyroot, Aplectrum hyemale, in Monroe County. This is the second extant record for this orchid in New York, and the first verified report for Monroe County since 1895! Puttyroot is a curious orchid – like Calypso and Cranefly orchid (Tipularia) it puts out a single leaf in the fall. This leaf is able to photosynthesize (when it is not snow covered) when temperatures are above freezing. Come spring the leaf begins to wither, and is usually gone by the time the plant flowers, typically in late May or June. This species can be easily overlooked. Look for puttyroot in rich beech-maple woods. Now is the best time to look for it. It will stand out in the mostly leaf covered forest floor, or with a fine dusting of snow. The leaves are distinctive with their pleating and white venation. The pleated leaves of the new puttyroot orchid discovery. Photo Steven Daniel. Steve Young and Kim Smith of the New York Natural Heritage Program surveyed a state park in Ulster County this week. Besides Kim finding a new population of Carex davisii, these are some of the other things we saw. The hophornbeams really stood out with their beautiful fruit clusters in contrast to the dark green leaves. Sycamore maple, Acer pseudoplatanus, has escaped here. The "atropurpurea" cultivar has purple undersides. Just outside the park were some impressive walls of Japanese knotweed. At one point we had an aerial view of the tops of red oak crowns. The crowns of large sassafras trees were also really neat to see. We updated the information for a population of Virginia snakeroot, Endodeca serpentaria, a state endangered plant. It grows in the forest herb layer. We found the small dry fruits under the leaf litter where the flowers of this cousin to wild ginger grow. The purple-veined basal leaves of rattlesnake hawkweek, Hieracium venosum, were common in the deer-decimated understory. Our botanizing drew the attention of this young barred owl who didn't seem to mind our presence. CLICK HERE to read and article and view drawings by Marielle Anzelone and Wendy Hollender about the plants that once grew in New York City but are now gone. 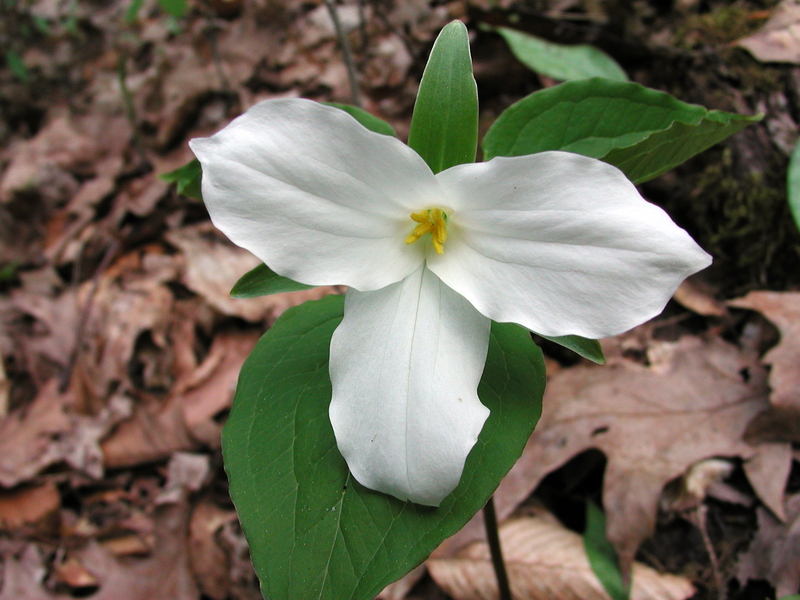 One of the plants that has not been seen in years is white trillium, Trillium grandiflorum. Photo Steve Young. All people interested in the conservation of Pennsylvania’s native flora are encouraged to attend this meeting. The Rare Plant Forum is a function of the Vascular Plant Technical Committee of the Pennsylvania Biological Survey, and for over thirty years has served in an advisory role to the Commonwealth of Pennsylvania for issues related to the conservation of the native flora of Pennsylvania. In addition to discussing proposed changes to the list of Plants of Special Concern in Pennsylvania (POSCIP), there will be a few related presentations. This is an excellent opportunity to connect and work with other botanists, amateur and professional, who share your interest in the flora of Pennsylvania. It is fitting for us to meet at a facility named for Otto E. Jennings, late Curator of Botany at the Carnegie Museum of Natural History and early advocate of native plant conservation. If you know of people who might be interested in attending, especially in NW Pennsylvania or adjacent parts of Ohio and New York, please extend this invitation to them. The proposal form is in an Excel spreadsheet, downloadable at http://www.paconserve.org/256. Related documents such as the definitions of the status categories and the minutes from past meetings are also available here. Please start working on your proposals right away, as John Kunsman and I will need some lead time to help gather the data. Please submit your proposals by 4 March. Proposals will be posted to the above url shortly after I receive them, and a summary will be distributed at least a week before the meeting along with an agenda. You are encouraged to consider presenting on recent work you have done related to the conservation of the flora of our region. One of the advantages of holding the Rare Plant Forum is the opportunity to share the results of our work. This can increase the value of your work by allowing others to build upon it. It also encourages collaboration and minimizes duplication of effort. Email or call me with the subject and how much time you would like. There will be time on the agenda for un-premeditated announcements, but it helps me plan if I have some idea how many there will be, so let me know if you can. Some of us will be having dinner on Friday at North Country Brewing in Slippery Rock. Let me know (sgrund@paconserve.org) if you would like to join us; I will make a reservation. Some of us are going to take advantage of the spring thaw on Sunday to explore a local stream, probably Wolf Creek. WPC owns land at Wolf Creek Narrows where we can take out and botanize. It is one of the best spring wildflower sites in the Commonwealth. Some experienced whitewater enthusiasts might brave Slippery Rock Creek Gorge. Email me if you are interested. We have reserved the Muskrat Cove group camping site at Moraine State Park for Friday and Saturday (http://www.dcnr.state.pa.us/stateparks/parks/moraine/moraine_mini.pdf). This will be primitive camping with water, but no hot water. The cost will be $10/night divided between everyone who camps. Please contact Kelly Sitch at c-ksitch@state.pa.us if you are interested.